Want to take part in future projects? 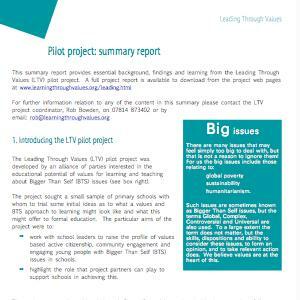 Leading through Values has now completed its initial pilot phase, but we are seeking support and interest for a continuation of the work and further involvement from schools in the future. If you are interested in potentially being part of any further phase then you may like to look at the documents emerging from the initial pilot project (right). These include a brief summary report, a full report, and a theoretical background paper called Case for Change that outlines the rationale of the project. If you would like an informal discussion about the project or any of these documents then please contact the project co-ordinator Rob Bowden by email or on 07814 873402. Leading through Values was led by Lifeworlds Learning on behalf of the Values in Schools Alliance which at the time of the project comprised Oxfam, British Red Cross, Lifeworlds Learning, Practical Action, Think Global and the National Children's Bureau (NCB). These organisations came together around a shared interest in values education. Their mutual agenda led to a discussion on forming an alliance to share insights and experience and to steer and create collaborative opportunities for furthering work around values education. Several other organisations including Keep Britain Tidy/Eco-Schools and Three Faiths Forum have expressed interest in joing the alliance for a future stage of work in schools, though this work is currently in the funding stages and is not yet fully active. If you would like to become involved then please get in touch with Rob Bowden. Leading through Values was inspired by earlier work on values and frames completed by a number of organistaions and known as Common Cause. You can link to the Common Cause work here. 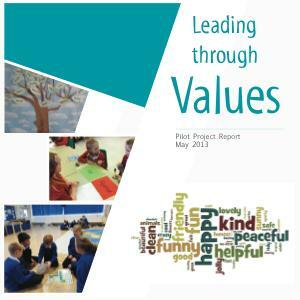 Leading through Values was a pilot project for primary schools in England supported by a number of leading educational organisations. It explores how values education links to school improvement and to enabling more active and engaged young citizens. 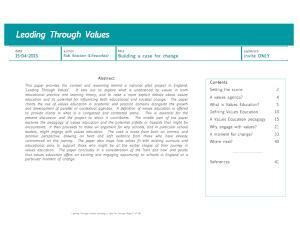 Building a Case for Change was written as a research paper to position the Leading Through Values project in a wider educational context. It reviews the growth of values based approaches to learning and makes key points as to why a values perspective on learning is apt for the present time.